So many speaking materials focus on micro-language: application of a grammatical form, pronunciation of a syllable, maybe memorization of a useful phrase. But students do not get much scaffolding for a macro-approach that integrates larger elements of language such as longer turns, or whole sections of a conversation with a particular purpose or theme. Richard Swales talked about analyzing written work in terms of rhetorical moves, or places where we start new sections with a new objective. 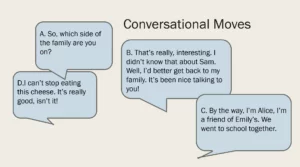 We can apply the same analysis to conversations, showing students different ways we perform conversational moves such as, starting a conversation, engaging in small talk, changing the subject, giving a vague answer, signalling disagreement, ending a conversation and so on. We can point them to the rich variety of ways we make these moves and how our voice, body language, word choice, and even grammar change depending on who we are talking to. So what do these moves look like? And how can we teach them in the classroom? Guess what social event this took place at. A. So, which side of the family are you on? B. That’s really interesting. I didn’t know that about Sam. C. Well, I’d better get back to my family. It’s been nice talking to you. D. I can’t stop eating this cheese. It’s really good, isn’t it? E. By the way, I’m Alice. I went to school with Emily. This conversation took place at a wedding. Note excerpt A. “Which side of the family are you on?” We generally ask this question at events with lots of people from your family, such as a wedding or family reunion or a funeral. Excerpt E. also indicates that there is an important person that everybody knows. There’s no way to know for sure the exact order. It’s more important to have students analyze the language and look for clues as to what the speaker is trying to do with words. However, the correct order is: D, A, E, B, C.
Note that excerpt D is a very common way to start a conversation at a social event. However rarely will you see a textbook that recommends discussing hors d’oeuvres as a way to strike up a conversation, or warns students that someone asking about cheese is really saying, “I’d like to talk to you.” Students need a sense of what kinds of topics people start small talk with and how to respond positively or negatively, but politely. Excerpt E is the logical beginning to a conversation and many textbooks model dialogues that begin this way. In fact, we often share our names a little later, when talking with a stranger and this can be a sign that we are enjoying talking to this person and want to continue the conversation. There are certain topics that we expect to talk about at various social events. They are considered safe topics that the other people will be prepared to talk about. They are good topics to bring up when you don’t know what else to talk about. For example, at a teacher’s convention, “What grade do you teach?” or “What class do you teach?” are safe questions to ask. At a wedding, “What side of the family are you on?” or “Are you with the bride or the groom?” are pretty safe topics along with, “How do you know Emily?” And they may bring out more interesting things to talk about. Excerpt B is clearly in reaction to a story about a mutual acquaintance. Again, telling interesting stories about people you both know is an expected and usually amusing topic of conversation at a social event. Note that there are topics that are taboo. You wouldn’t tell a story about the time Sam got drunk and crashed his car through his house to something you didn’t know well, for example. There’s a fine line between a surprising fact and an embarrassing one. 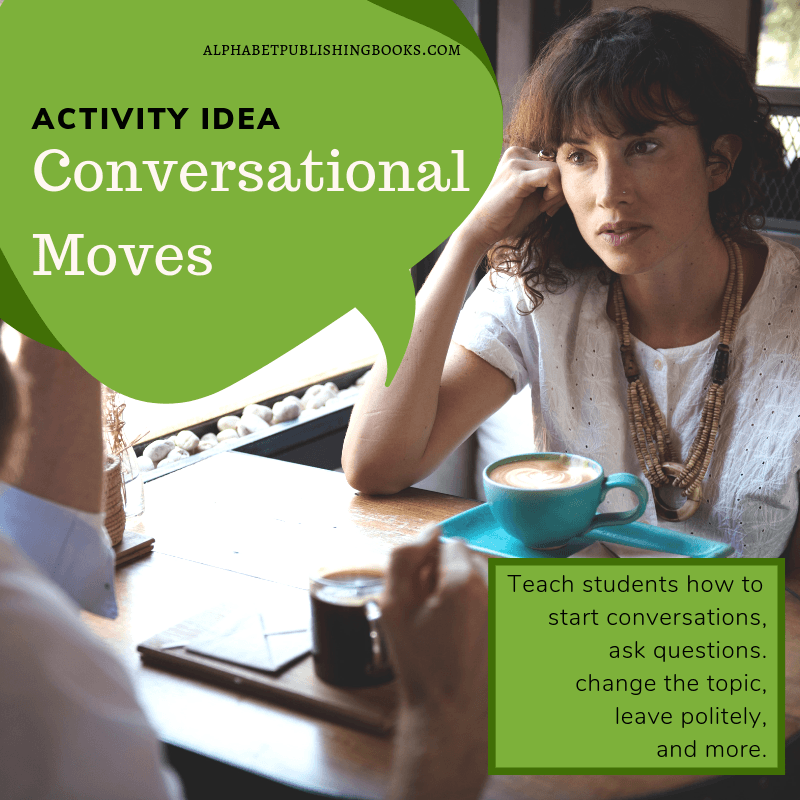 To continue this lesson, you could now present larger chunks of a conversation and have students look at how they fit together as a whole. How does the conversation become more intimate and personal? When do the speakers chose to change the subject or continue the same topic? Students can also flesh out the excerpts into a longer conversation themselves. Students could then write an outline of the conversational moves and then create a new dialogue in a new setting. In this way, they can see how our choice of words and phrases depends on the context, setting, and relationships. You can easily recreate this activity yourself. You are welcome to borrow this example. 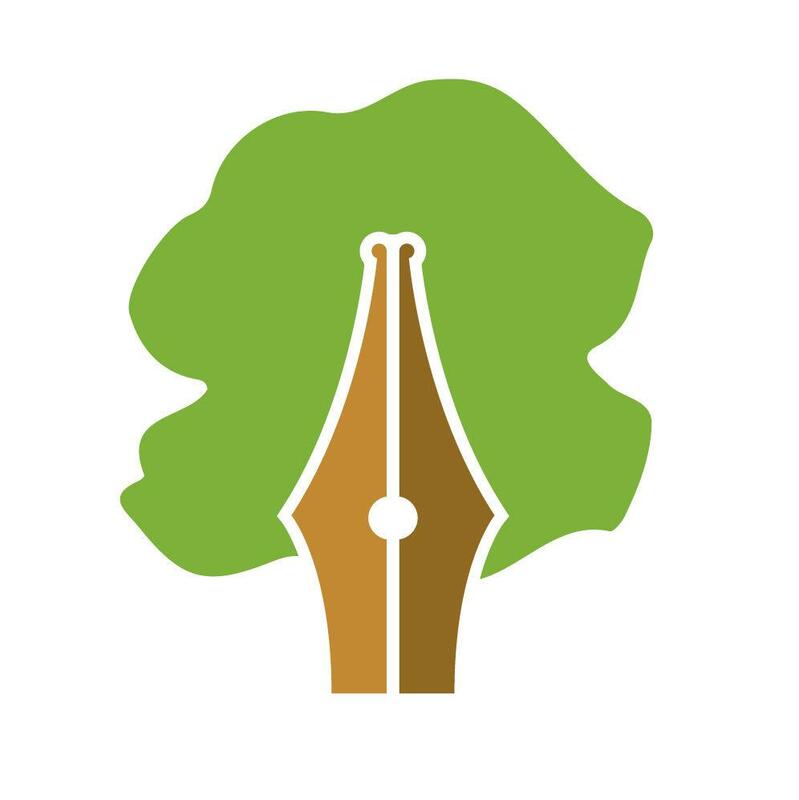 Or create your own cut-up conversation with any conversation you participate in or overhear, write your own dialogue, or take extracts from a play or piece of fiction. In some cases, the context may not be clear. Or the conversation may fit into many different contexts. In that case, ask students to guess the purpose of the conversation and/or the relationship between speakers. Is one person trying to persuade the other to do something? Are two co-workers discussing a mistake and trying to avoid blame? When you get to the excerpts, have students discuss the purpose of each one. Why did the speaker chose those particular words? What other ways could the speaker have achieved the same goal? Finally, you can apply this technique to academic skills. Students can analyze rhetorical moves in a speech or a debate. Where is the speaker deploying an example? Where are they presenting a counter-argument? How do they cite support? What techniques do they use to make their rhetoric persuasive or beautiful?